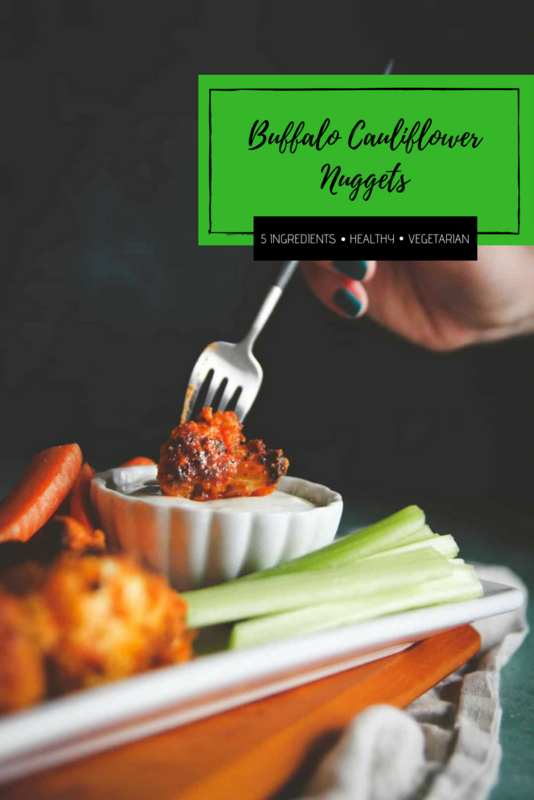 I am going to try to do these amazing 5 ingredient buffalo cauliflower nuggets justice in this post, because they are the best vegetarian appetizer ever! 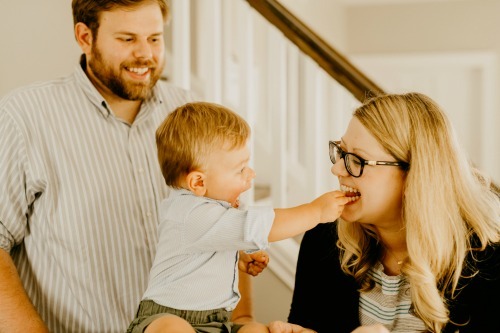 It was a few months ago when I was getting my hair dyed (one of the things they don’t tell you is that sometimes you can get a bunch of grey hair after having a baby lol, oh the joys) and I was talking to my beautiful stylist and asking what she likes to eat. 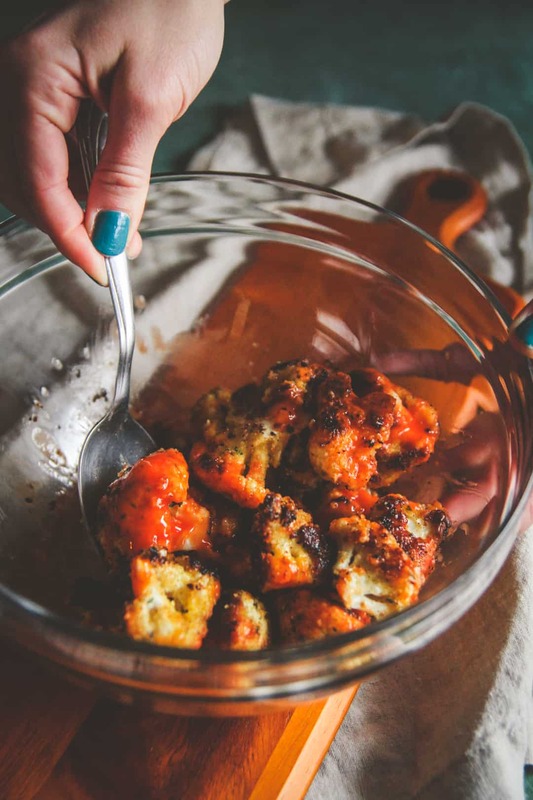 She told me that her whole family is vegetarian and that she started making these buffalo cauliflower nuggets and that they were a HUGE hit with everyone (including kids and teens). I have vegetarian family members and friends too, so I always love hearing new ideas. I had to know more. Buffalo cauliflower nuggets? Did they taste weird? I had to experiment at home. You guys!! I was blow away by how insanely delicious these cauliflower nuggets are! Because you’re frying the cauliflower nuggets, they cook but don’t become mush, so the texture is like a boneless chicken wing! 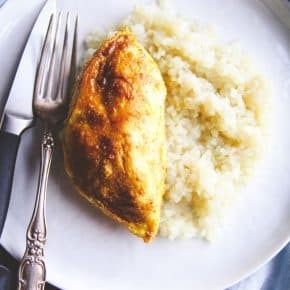 AND, I realized that there are only 5 ingredients: cauliflower, eggs, breadcrumbs, olive oil, buffalo sauce which make it perfect for this weeks’ 5-ingredient Friday recipe! 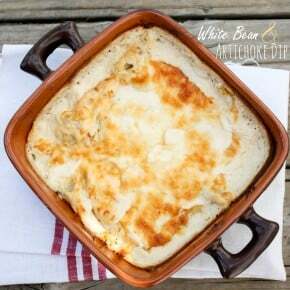 I ended up serving these at a party too, and everyone loved them (even the guys, no joke)! 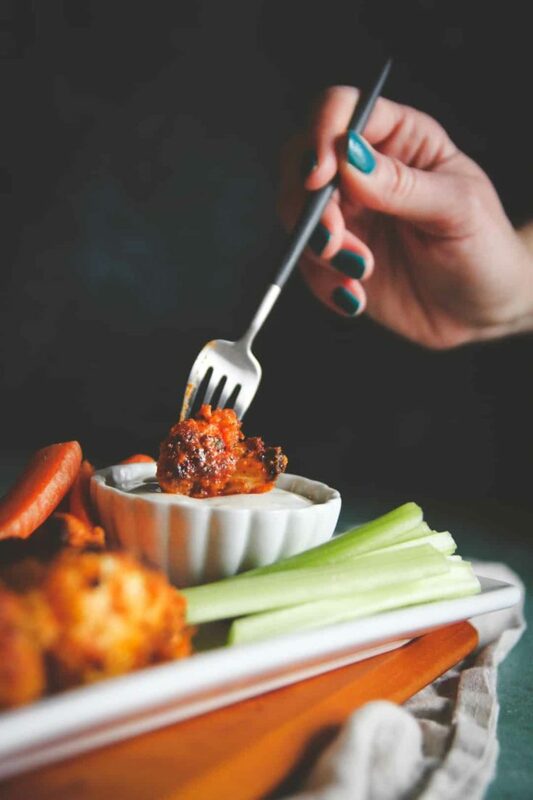 So the next time you’re looking for a vegetarian party appetizer recipe, look no further than these 5 ingredient buffalo cauliflower nuggets. Start by making cleaning the head of cauliflower and cutting it up in to florets. You want them small enough to pick up, but big enough so they won't be too small and fall apart. I'd say a little bigger than quarter size in diameter. In a shallow bowl whisk together eggs and water. In a second shallow bowl pour breadcrumbs. In a large pan over high heat, add 1-2 tablespoons of olive oil. I do pouring in a circular motion, about twice around the pan. 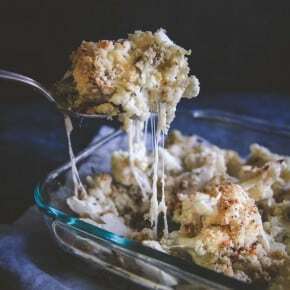 It doesn't need to be in an even layer or anything, it just needs to be enough so that when you add the cauliflower, all the florets get a little bit coated. Heat the oil for 1-2 minutes, then turn down to medium-high. 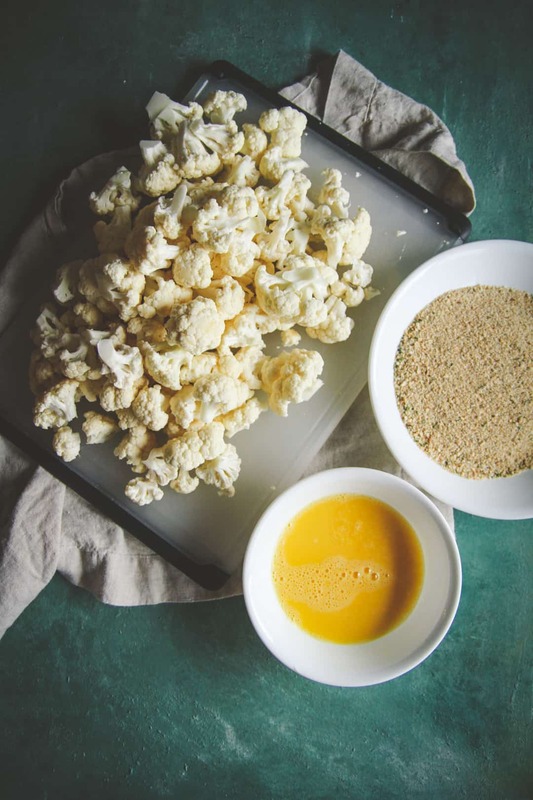 Working in batches, add cauliflower to the egg mixture, then transfer to coat with the breadcrumbs, then put into the pan. 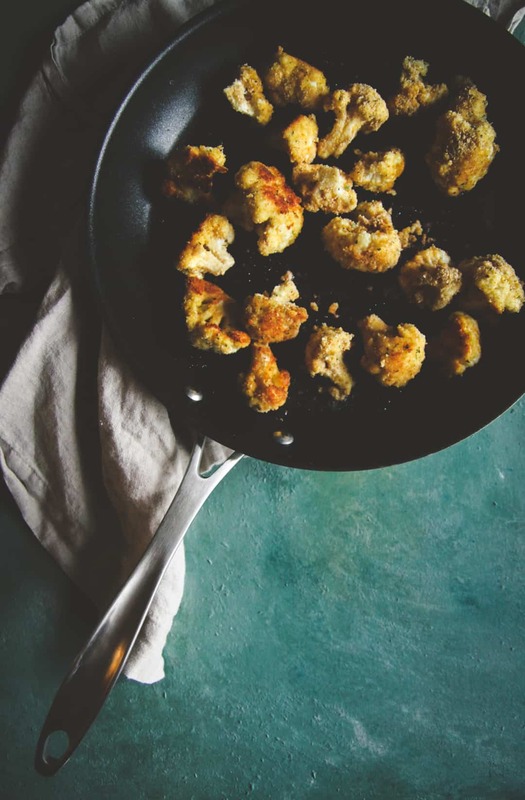 Fry the cauliflower nuggets for about 5-6 minutes, flipping occasionally. Test one to check for done-ness. They should be golden brown on the outside and soft yet have firm on the inside. Repeat in batches until all the florets are cooked. Transfer to a bowl, pour about 3 tablespoons to coat the cauliflower nuggets, toss them, then serve. Repeat with each batch of freshly fried nuggets. 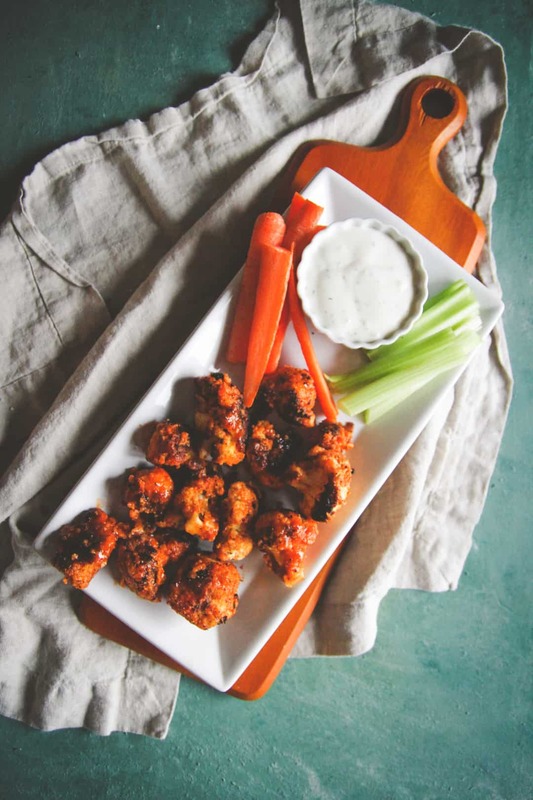 Could the 5 Ingredient Buffalo Cauliflower Nuggets be done in an Air-Fryer? Oh my goodness, YES!!!!!!? What an absolutely perfect idea!!! These would be amazing done in an air fryer- I’ve heard nothing but good things about them! Yum! I wish I saw these before the Super Bowl, maybe the Patriots loss wouldn’t have been so tough to take! 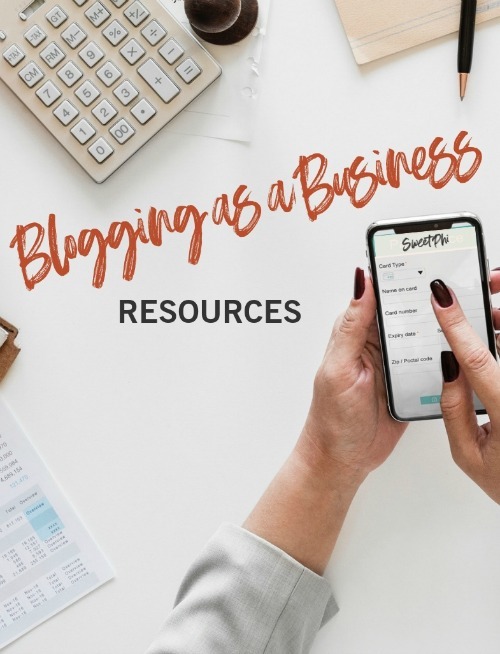 Pinning this too – yummy! Haha, totally understandable! So glad you like these, and thank you so much for pinning!!! !